Typical swimming speed is about 12 miles per hour. Short bursts are possible up to 22 MPH. When dolphins repeatedly bow (or jump) as they swim rapidly forward, it is called "porpoising". In this beautiful video (courtesy of Ron Graening and Adolf Wegmann) a large pod of dolphins is seen porpoising. This is an odd term for a dolphin, as a porpoise is a different animal than a dolphin. Porpoises are in the same class of animals called Cetaceans, but are a different species. Perhaps the name porpoising was coined because porpoises often swim in this manner. Porpoising while swimming is an advantage to a marine mammal such as the dolphin because it allows the animal to spend a portion of its swimming time out of the water where there is less drag or resistance against its body. Thus, it allows the animal to achieve faster swimming speeds. In the structure of a neuron, nature uses this same principle of reducing drag to increase speed across a distance. Neurons (seen in the diagram below) are nerve cells found in the nervous system of most animals, including man. Nervous impulses pass from neuron to neuron along pathways called axons. These electrical impulses travel nearly 200 miles per hour along the axon in order to provide rapid communication to other parts of the animal's body. 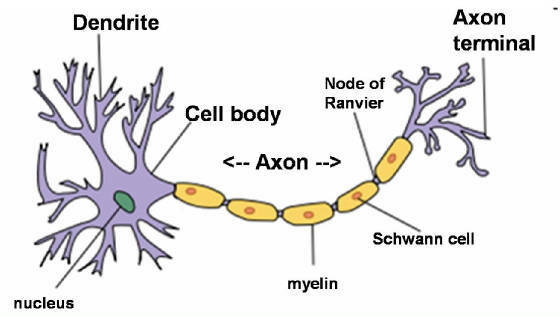 Each axon is covered with sections of "insulation" called myelin. A small portion of axon is exposed between each of these myelin sections. This speed is possible because the impulse does not actually pass along the entire axon of each neuron. As it travels along the axon, the impulse goes from one section of exposed axon to another by jumping over each of the myelin sections, essentially reducing its "drag", or resistance, to reach the next neuron and, eventually, its targeted response site. The dolphin's porpoisiong behavior may, indirectly, also provide more time for the animal to view its environment above the surface and may provide a fun activity for the dolphin. This behavior, when associated with a ship's wake, is termed "bow riding", another form of porpoising. A major part of the dolphin's day is spent in social behaviors. Social interactions between dolphins may include rubbing, touching pectoral fins, nursing, mating, and synchronous displays (performing behaviors together such as bows). Athletic behaviors may include breaching (a form of a bow), porpoising and spy hopping (the dolphin's head rising vertically out of the water to look around). Dolphins appear to prefer association with other particular dolphins and also appear to recognize each other even after being separated for long periods of time. Aggressive behaviors are used to establish dominance in the pod, a sign of frustration or annoyance, or a response to aggression from others. Agression is used as a tool to manage relationships with others (as most animals do). They may include tail slapping (kerplunking), jaw popping, pectoral slapping (as seen in the video below), chasing, head-to-head racing, squawking at each other and raking. Males fighting with each other for access to sexually available females is another example of aggressive behavior. Following such behavior, the aggressors will often touch each other in a social way, almost as if they are "making up". Sometimes the aggressive behavior is more psychological (e.g. taking an arched or "S" position) than physical (e.g. fin and tail slaps, open mouths, squawking). Most animals (including dolphins) associate various body positions with what another animal is about to do. Aggression is one of those predictors of behavior. In the following video a 19 month old female dolphin calf is attempting to assert herself with her mother nearby. The calf breaches (comes out of the water, landing on her side). Breaching is an aggresive behavior. The mother, a 10 year old dolphin, immediately swims alongside the calf to re-establishes HER dominance by slapping her pectoral fin near the calf. Young animals perform these behaviors as a preparation for adult life when they will attempt to be the dominant dolphin in their adult pods. Male toughness is often displayed by head-butting. Acts of aggression between dolphins can become so intense that the animal to which the aggressive behavior is targeted will often go into exile, leaving its pod as a result of losing a fight. Aggressive behavior often accompanies mating. The male will posture in front of the female with his back arched. He will stroke, rub and nuzzle her. Mouthing and jaw popping are also forms of aggressive mating behaviors. Infanticide, or the intentional killing of infants, has been observed with dolphins. There are reported cases of male dolphins seen "calf tossing", or throwing calves into the air to kill them. It is believed that adult male dolphins will kill a calf to cause the new mother to go into estrus and again be available for mating. Dominant female dolphins have also been observed "stealing" newborn calves from sub-dominant new mothers. Ethology is the study of an animal's behavior as it relates to its environment. Dolphin social behavior is often studied in captivity using a tool called an "ethogram". An ethogram is a catalog of specific behaviors employed by any species. In producing an ethogram, an observer records behaviors of an animal which may be repeated and have significance. There is a level of ambiguity in producing an ethogram, as it is highly dependent upon the observer’s skill in recording these repeated behaviors. Behaviors are described without reference to their purpose, making the ethogram a record and not an interpretation of behavioral effect.